Indoor Air Quality (IAQ) is a high priority in the sustainable design and renovation of commercial buildings, with the objective of providing clearer, uncontaminated interior air for building occupants. Working toward this important objective requires a proactive stance against potential threats to occupant health, such as mold and microbial growth. The importance of mold-preventive design in wall assemblies has led to the development of stronger moisture management strategies to prevent this problem. 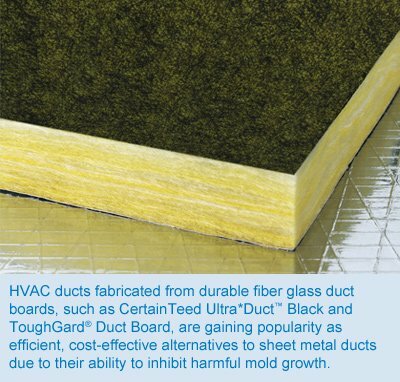 Often overlooked, however, is adding fiberglass insulation to the ductwork of a building’s HVAC system as an additional tactic for fighting mold within the building envelope. Ductwork is a significant target for mold prevention and, therefore, demands the consideration of HVAC professionals. Metaphorically speaking, the HVAC system is to buildings what lungs are to the human body — it is responsible for ventilating stale or contaminated air from a space and replacing it with fresh, clean air. The ductwork of the HVAC system is the conduit that transports this air throughout the building. Taking this into consideration, it’s important to keep the inside of the ductwork clean and dry. Any impurities, such as mold and microbes, present in the ductwork can be drawn into the interior air that building occupants breathe. Mold and microbial growth can occur inside uninsulated sheet metal ductwork whenever excess moisture is present. This moisture can be the result of condensation that forms on the inside and outside of ducts. During the summer, as cold air travels through warm, uninsulated ducts, beads of moisture form on the interior or exterior of the ducts. In winter, the same occurs when heated, humidified air passes through cold ducts. 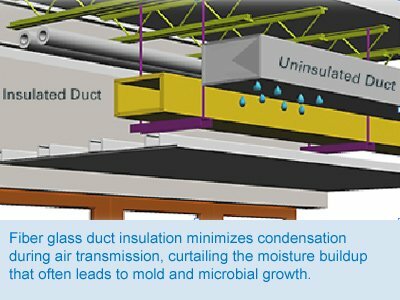 There is high potential for condensation on duct surfaces whenever the temperature is either equal to or lower than the dew point temperature. Condensed moisture becomes an IAQ threat when it combines with dust or dirt in uninsulated ducts to foster mold and microbial growth. If not prevented or caught in its early stages, the mold and microbial growth will quickly spread and pollute interior air with harmful airborne mold spores. Extended inhalation of airborne mold spores can significantly impact the health and comfort of building occupants, often causing headaches and irritability or more serious respiratory ailments, such as asthma. The American Society of Heating, Refrigeration, and Air-conditioning Engineers (ASHRAE) Standard 62.1, Ventilation for Acceptable Indoor Air Quality, lists strategies for improving IAQ through mold and microbial growth prevention. Two of the most effective solutions recommended are to properly seal HVAC ductwork and to insulate it. These steps help prevent mold growth by allowing ductwork to maintain a constant temperature, which significantly reduces the possibility of condensation forming on duct surfaces. The most common duct insulation material, by far, is fiber glass. In addition to helping maintain a constant temperature, fiber glass — as an insulation material — is inorganic and, therefore, does not support mold growth or act as a nutrient for mold growth. It is also a safe, bio-soluble material. 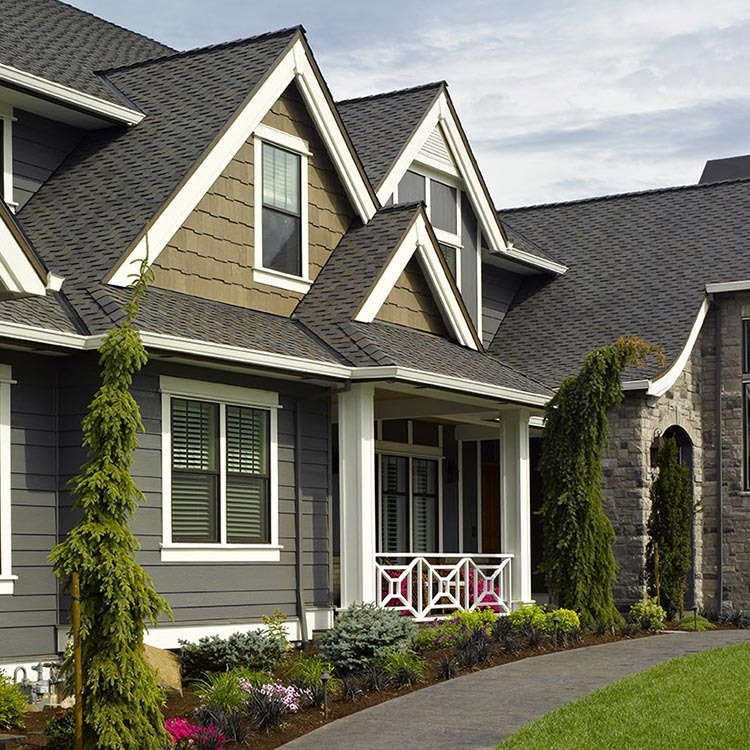 More than 20 studies conducted at noted universities and laboratories, including the World Health Organization, have examined concentrations of fiber glass and other Synthetic Vitreous Fibers (SVFs) in residential and commercial buildings and consistently found they do not significantly contribute to indoor air pollution, refuting earlier research claims. Fiber glass duct liner is applied to the interior of a rectangular sheet metal duct and designed to control heat loss or gain through duct walls, assist with quiet air distribution and control condensation. Fiber glass duct liners are resistant to mold growth and fiber erosion in accordance with industry standards and prevent the distribution of airborne mold or glass fibers. With mat-faced airstream surfaces, the duct liners will resist damage during installation, maintenance and cleaning. 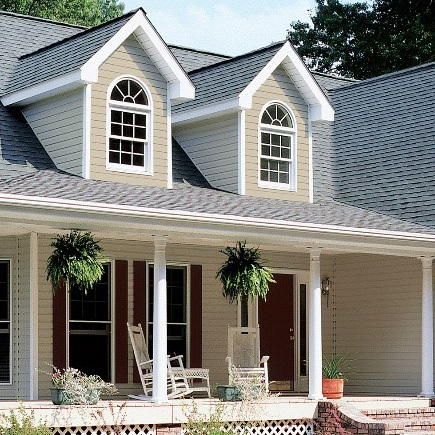 They are manufactured in both roll and board form and are is available in a variety of densities and thicknesses. Fiber glass duct wrap is resilient blanket insulation, with a vapor retarder facing, made to fit snugly over rectangular, spiral, flat oval or irregularly shaped surfaces. It can be easily cut and fitted for a neat, thermally effective installation and comes in various thicknesses and densities. 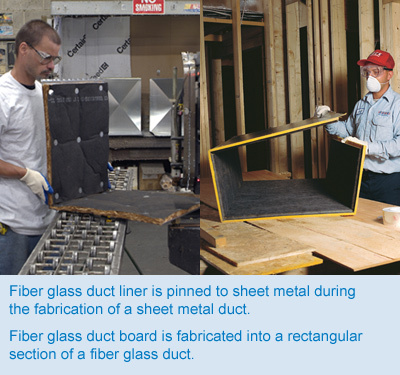 Fiber glass duct board is a 1- to 2-inch thick, rigid board (manufactured from resin-bonded inorganic glass fibers) that is used to fabricate fiber glass ductwork. 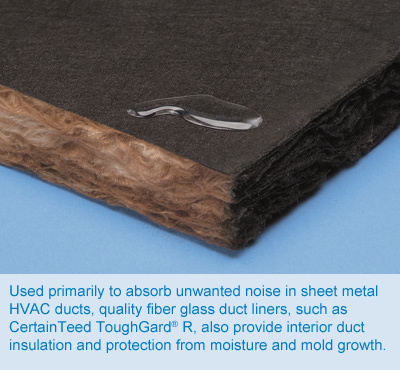 For commercial applications that require thermal insulation, condensation control and acoustic control, fiber glass duct board provides an efficient, lower-cost alternative to sheet metal. Since insulation is integrated into the duct board, fiber glass ducts don’t require as many fabrication steps as insulated sheet metal ducts. The outside surface of the duct boards should feature a factory-applied reinforced aluminum air barrier and a vapor retarder, which minimizes air leakage and moisture accumulation. Fiber glass commercial board — available unfaced, or with FSK or ASJ facings — is applied to the exterior of round, rectangular, oval or irregularly shaped ducts, plenums, chillers and other HVAC equipment. Ranging from flexible to rigid, commercial board products are used to reduce heat loss or gain through duct, plenum and equipment walls. 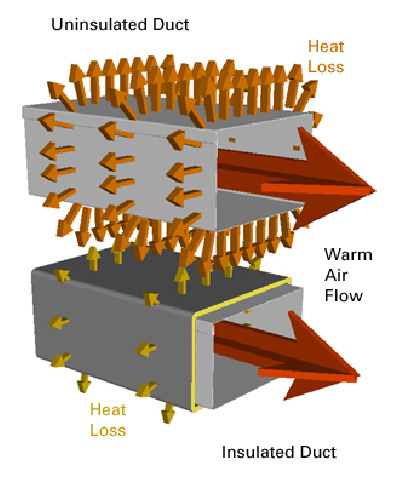 Energy Conservation/Temperature Control — Most HVAC system designs for commercial and residential applications include insulated ductwork to minimize the amount of heat loss in the winter and cool air leakage in the summer. HVAC ductwork needs to perform efficiently to conserve energy and keep utility bills at a minimum. When combined with properly sealed ducts, fiber glass duct insulation plugs potential leaks, providing excellent thermal performance and occupant comfort. Acoustic Control —Noise traveling through bare sheet metal ducts throughout the entire building can cause reduced productivity and comfort among building occupants. Properly installed fiber glass duct insulation absorbs this excess noise. 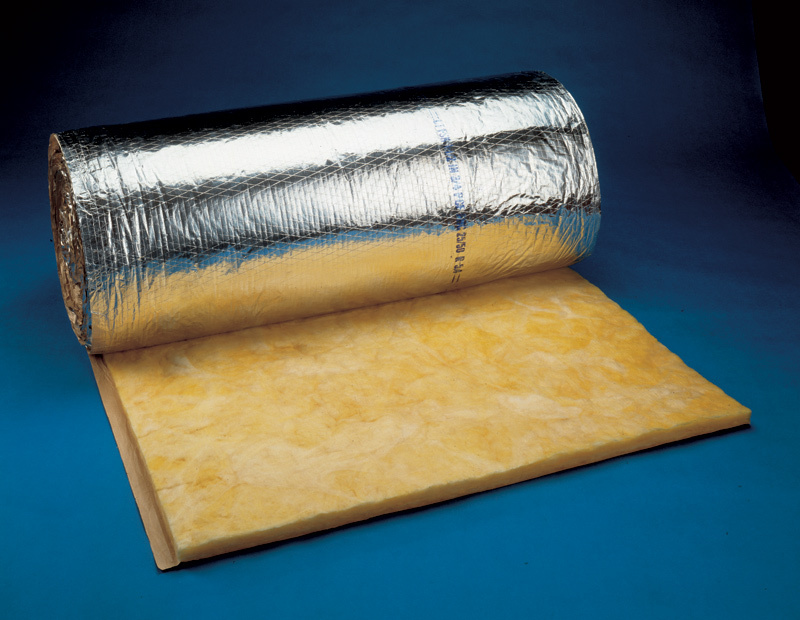 Careful selection of insulation materials, such as duct liner, can significantly decrease noise levels. Both fiber glass ductwork and metal ductwork lined with acoustical insulation can help control undesirable clatter, such as aerodynamic noise, breakout noise, mechanical equipment noise and crosstalk. Fiber glass duct insulation can provide significant improvement to a building’s interior environment. However, this all depends on how well it and the ductwork are maintained. Like any other building component, ductwork and duct insulation need proper proactive care to get the best performance. It is important to schedule periodic filter changes and duct maintenance visits to keep the ductwork clean and in working order. Since preventative maintenance is very important in HVAC system design, many architects and engineers are now adding this recommendation to their specifications. Contact vacuuming, which involves the conventional vacuum cleaning of interior duct surfaces. The hose of a high-powered vacuum cleaner with a high-efficiency particle arrestor (HEPA) filter is inserted through access holes cut into the ductwork. Particles that become airborne through cleaning that are not collected by the vacuum hose are drawn downstream through the duct and are removed from the system, preventing their release into the occupied space. Air sweeping, involving the introduction of compressed air into the duct through a hose capped with a skipper nozzle. The compressed air propels the nozzle through the ductwork, dislodging dirt, dust and debris. The dislodged particles then become airborne and are drawn downstream through the duct and out of the system. Power brushing, by which a pneumatically or electrically powered rotation bristle brush is used to loosen dirt, dust and debris and draw this material downstream into a vacuum collector. When dealing with fiber glass ducts or sheet metal ducts lined with fiber glass insulation, duct cleaning professionals must take special care to use only specially designed brushes with soft, flexible polymer bristles that remove debris without putting extra stress on surfaces. In addition to filtration maintenance, the internal drain pans should be periodically cleaned to prevent moisture carryover and formation of biofilms in the pans. Humidifiers should be checked to prevent oversaturation of the conditioned air as well. Properly sealing and insulating sheet metal ducts or installing fiber glass ductwork are excellent, proactive ways to improve the IAQ of a building. High IAQ contributes greatly to the sustainability of buildings, and provides a purer and more comfortable interior environment. As a result, building occupants will be healthier and more productive, which benefits the owners of the building. It’s a win-win situation. Jim Voitel has more than 30 years of experience in HVAC system design, construction and product development. He is product manager of CertainTeed’s HVAC insulation portfolio and is actively developing sustainable insulation products for the HVAC industry. 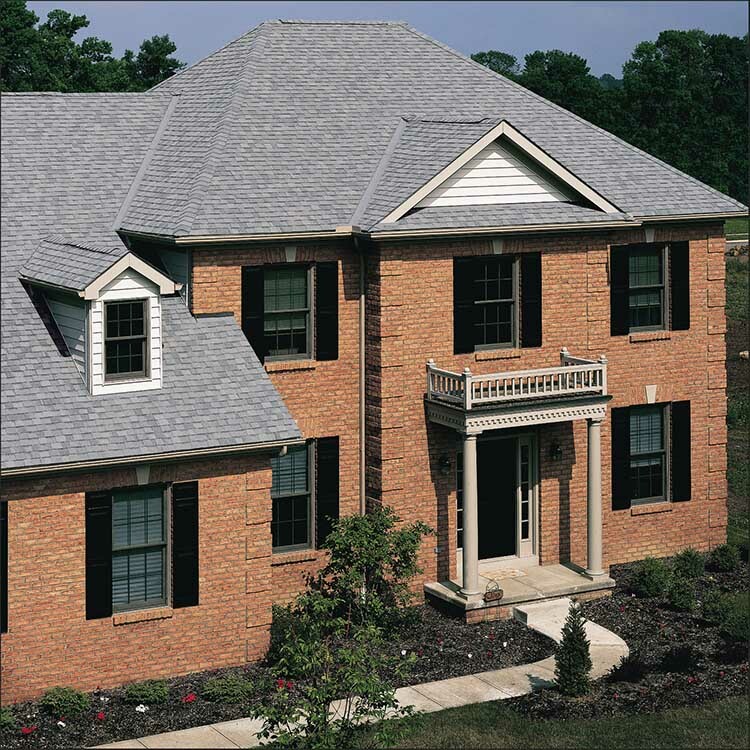 Reduce unwanted heat loss or gain and condensation during system operation. A rigid board designed for fabrication into supply and return air HVAC duct work. A rigid board with a tough, durable airstream surface for a superior duct system that keeps moisture out and comfort in.